Is Your Neighbor a Closet Egalitarian Revolutionary? Is your neighbor a closet egalitarian revolutionary? Don't know? Well it's time you found out. Not sure exactly how to do that? It's easy. Print a copy of This I Believe and ask your friendly neighbor if he or she would like to add his or her signature to the 693 others who have already signed it. * While you're at it, ask the person who delivers your mail, and the person who rings up your grocery order and anybody else you know and like. You'll be surprised how many closet egalitarian revolutionaries there are, i.e., people who gladly will sign This I Believe if only somebody asks them to. Oh no! Are you shaking your head left to right? Is this what you're thinking? "Not my neighbor!" "Not the person who rings up my groceries!" "They're not radicals (or progressives, or whatever you call yourelf) like me." Still, the fact is you don't actually know for certain if they would sign or not, do you? I dare you to find out. Why am I saying all this to you? Good question. As you know, we need to remove the rich from power so that we can end the terrible things they do to dominate people and strengthen their power. Well, how are we going to remove the rich from power? It can only happen if a huge mass movement aims to do it. And this requires, for starters, that people talk to each other about doing it. You're right! If most Americans don't want to remove the rich from power and create an egalitarian society then it won't be possible, and it would be crazy to even try. 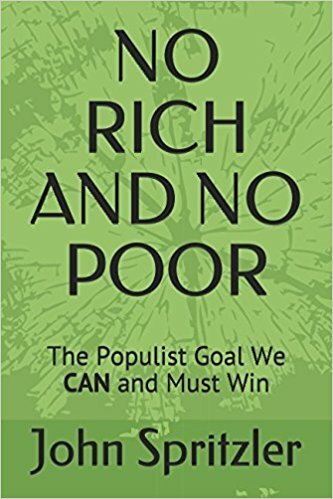 But here's something you may not know: When we asked people on the sidewalks in Boston and nearby neighborhood towns to sign This I Believe (which says we should have no rich and no poor and we need a revolution, among other great things) 75% of the people who stopped to read it signed it. The reason there is so much hopelessness about the possibility of removing the rich from power today is not that most people don't want to do it; it is that most people don't KNOW that most people want to do it. When people discover that they are not alone in wanting to remove the rich from power to make things much more equal and truly democratic, that is when hopelessness will be replaced by hopefulness, and grudging acceptance of the dictatorship of the rich will be replaced by creative organizing aimed at eventually overthrowing that dictatoship. But this won't begin to happen if you and millions like you don't find out if your friendly neighbor is a closet egalitarian revolutionary. * 693 people have signed out of approximately 920 people who have read it on the sidewalks in the Boston area where a handful of us have begun collecting signatures for it to display to the public. Read about this Ring the Bells of Revolution campaign here. ** As I discuss here, one of the main purposes of the government's NSA spying on us is to make us afraid to talk openly with others about our revolutionary aspirations. But our response to this spying should be to talk even more openly, because our strength is in numbers--numbers who know they are not alone. Don't forget, the reason the Czar of Russia had to abdicate in 1917 wasn't because he didn't know who the revolutionaries were; it was because there were too many of them.